On Seminary Ridge that morning, seeing the Federal army entrenched, guns bristling from the heights around Gettysburg a mile or so away, Lee’s most trusted general, Lt. Gen. James Longstreet, proposes to his commander a sweeping flanking movement; to disengage from Gettysburg and move the Confederate army between the Federals and Washington. This Longstreet believed would compel the Union army to follow and then Lee could find and then fight on ground of his own choosing. Confederate attack on July 2nd. 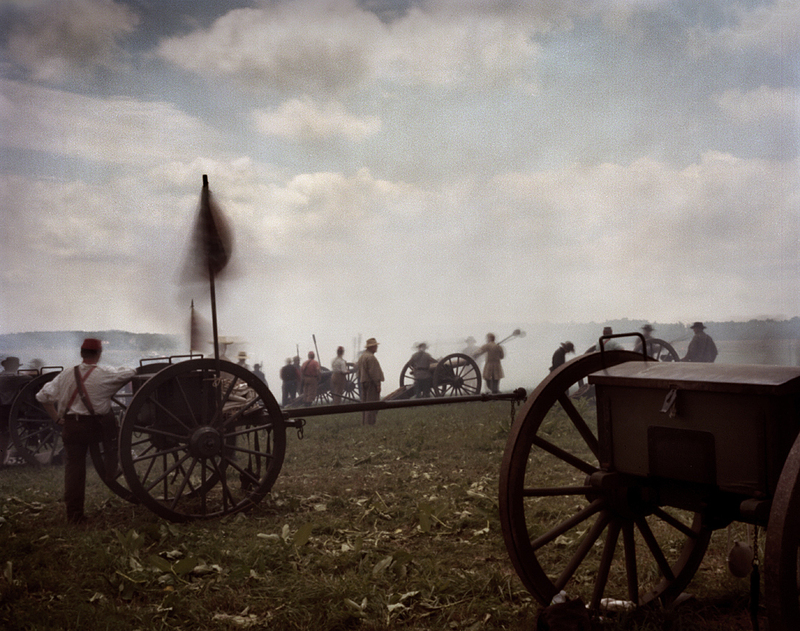 1863 nearly destroyed the Union position at Gettysburg. 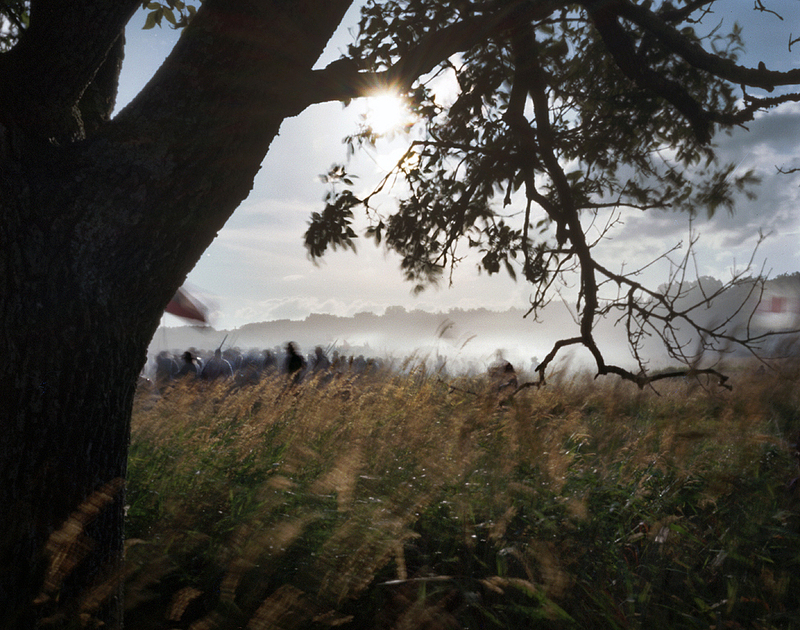 Longstreet’s attack on July 2nd, ordered by Lee, would be fought over a landscape now famous for the intense struggle there. 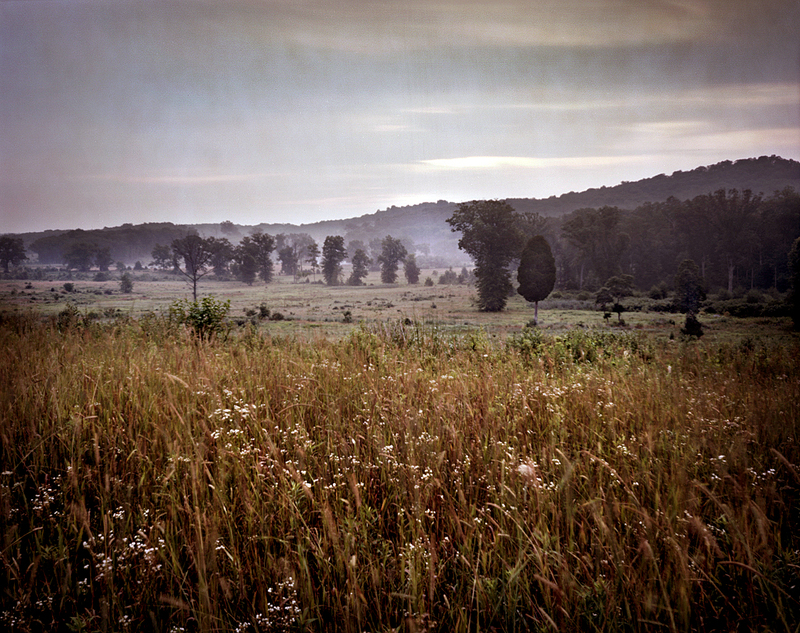 Innocuous names like, The Wheat Field, The Peach Orchard, the infamous Devil’s Den and “the two rocky hills”, Little and Big Round Top, became the epicenter of the fighting on July 2nd. Additional fighting in the late evening at Culp’s Hill and East Cemetery Hill made July 2nd. 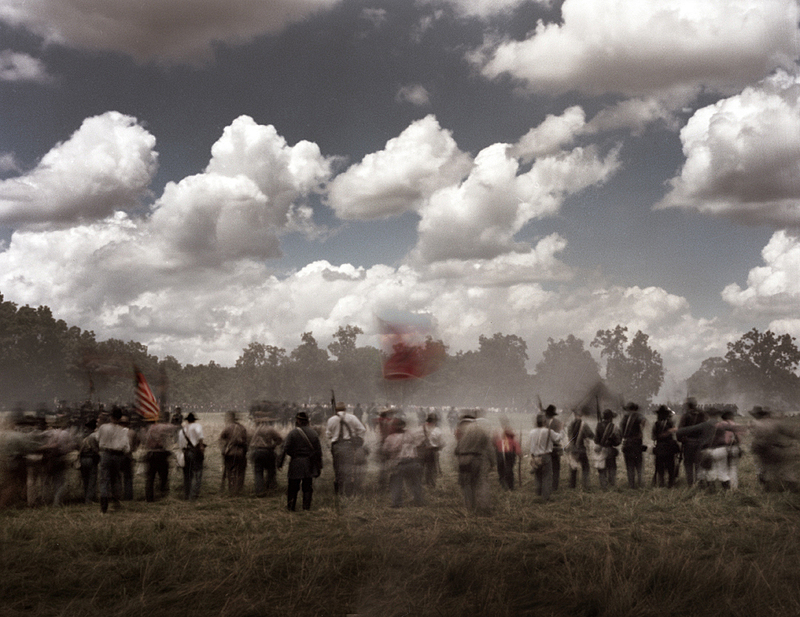 1863 the bloodiest day in the three day struggle at Gettysburg. But the “butcher’s bill” on July 2nd, at least somewhat, might have been avoided if Union Maj. Gen. Dan Sickles hadn’t disobeyed orders. 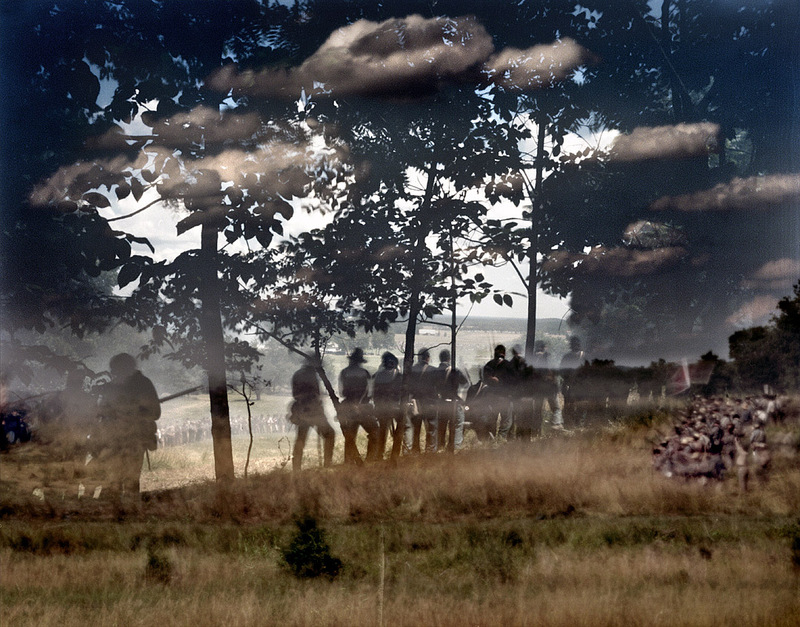 Standing on Cemetery Ridge in position with his III Corps, Sickles couldn’t help but notice that there was high ground in front of him, between his position and the enemy. 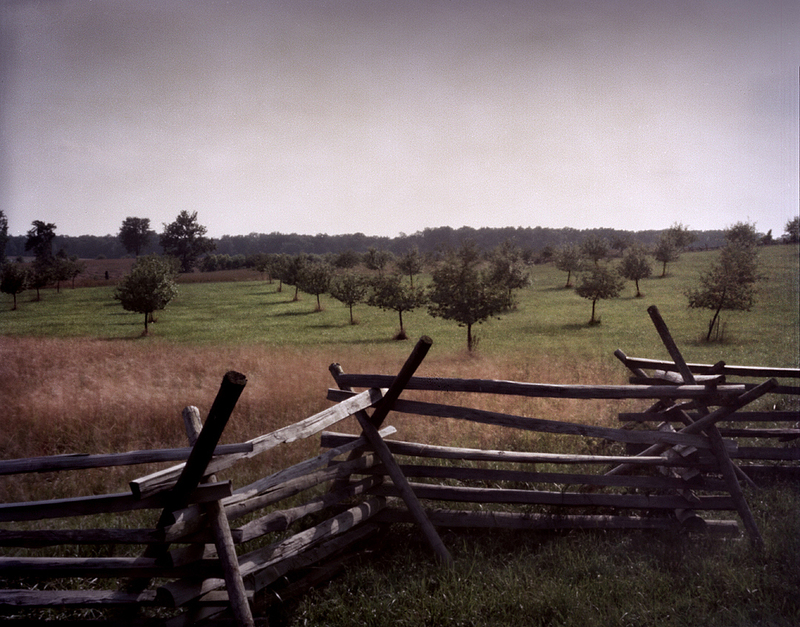 Fearing the enemy might gain this high ground Sickles seeks out General Meade for permission to move his men foreword. Meade declines sighting the integrity of the Union battle line. Dan Sickles position ordered by the commanding general was to deploy along Cemetery Ridge and extend his line to the Round Tops. 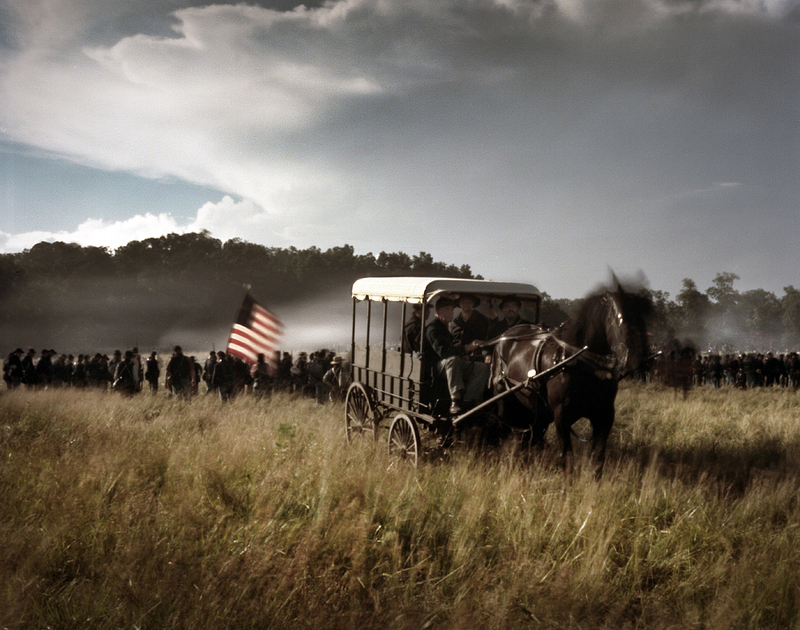 The reenactments of the fighting on day two at Gettysburg were stirring as thousands of reenactors took to the field to play out this 150 year old drama. 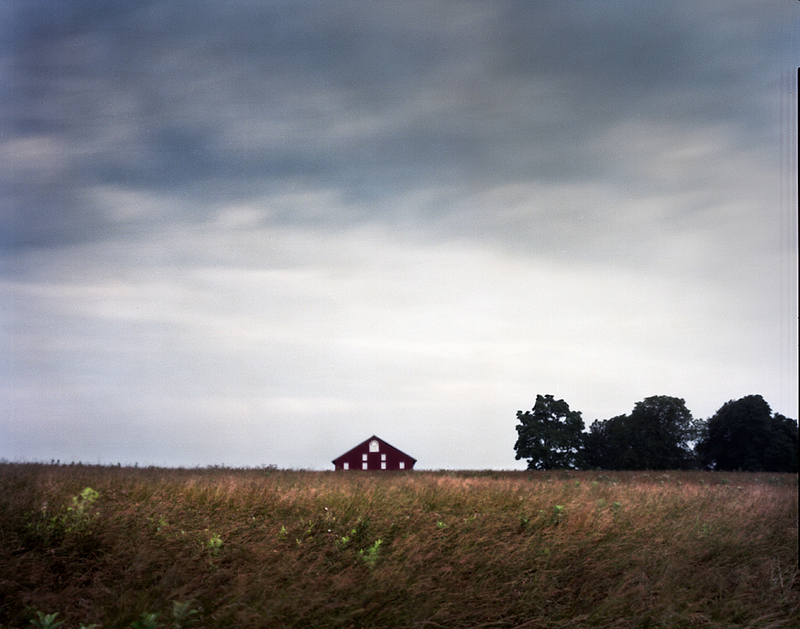 The Bushey Farm, just south of Gettysburg, was the scene of the Blue & Grey Alliance reenactment in late June 2013. The huge farm contained various types of topography, open fields, wooded hills and period farm buildings with dirt roads snaking through the landscape. The BGA organizers planned a four-hour continuos battle on day 2 at the Bushey Farm. 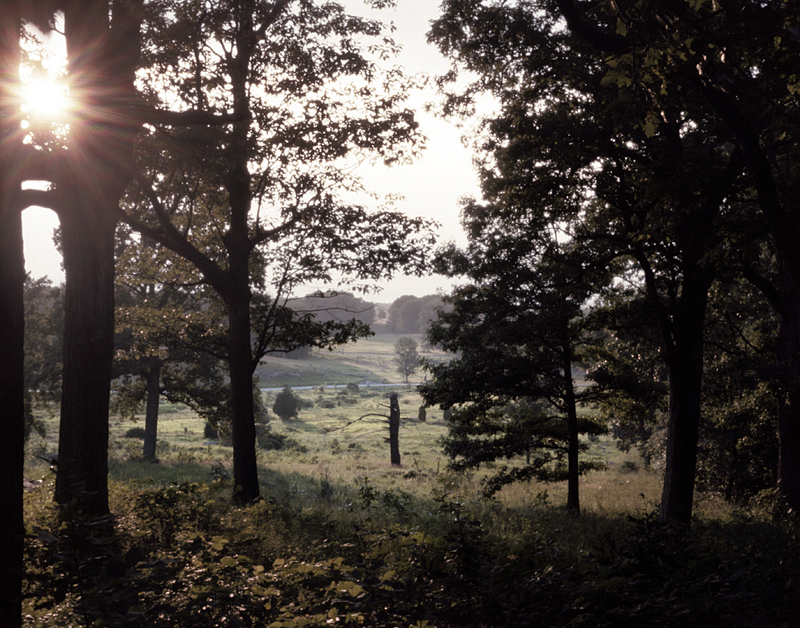 Starting at the “Little Round Top” the fighting would then move on to the “Devil’s Den”, rolling into the “Wheatfield” and ending with a reenactment of the fighting at the “Peach Orchard”. 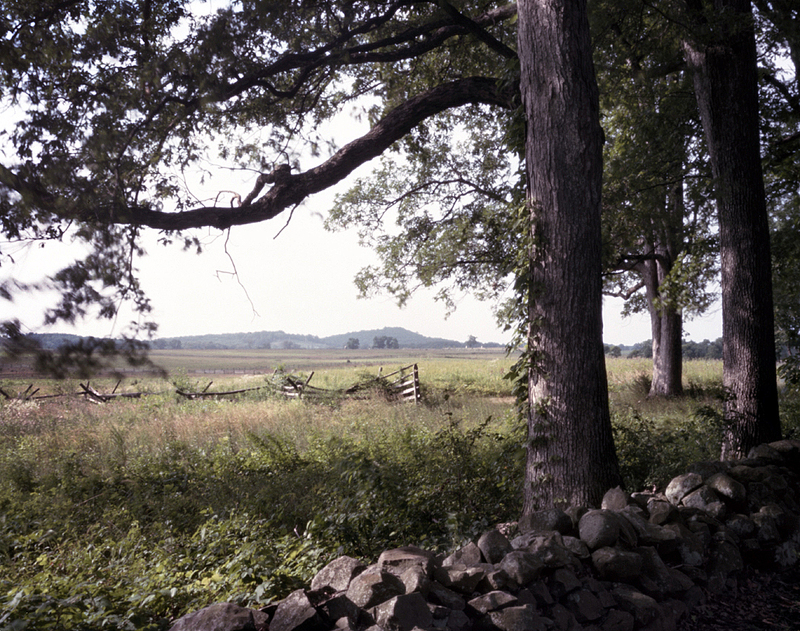 The wooded hills on the Bushey Farm served as “Little Round Top” for this scenario. 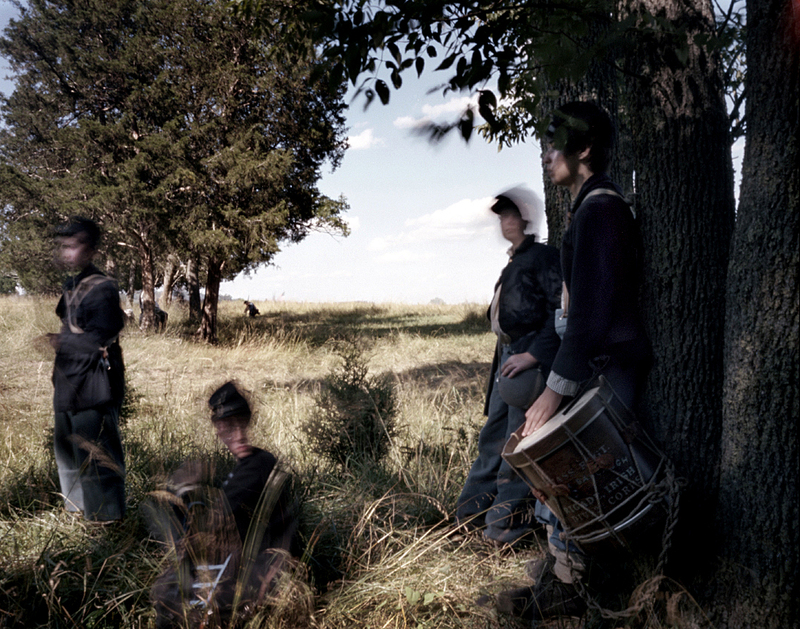 The troops in blue lined the tops of the wooded hills and waited for the Confederate onslaught. 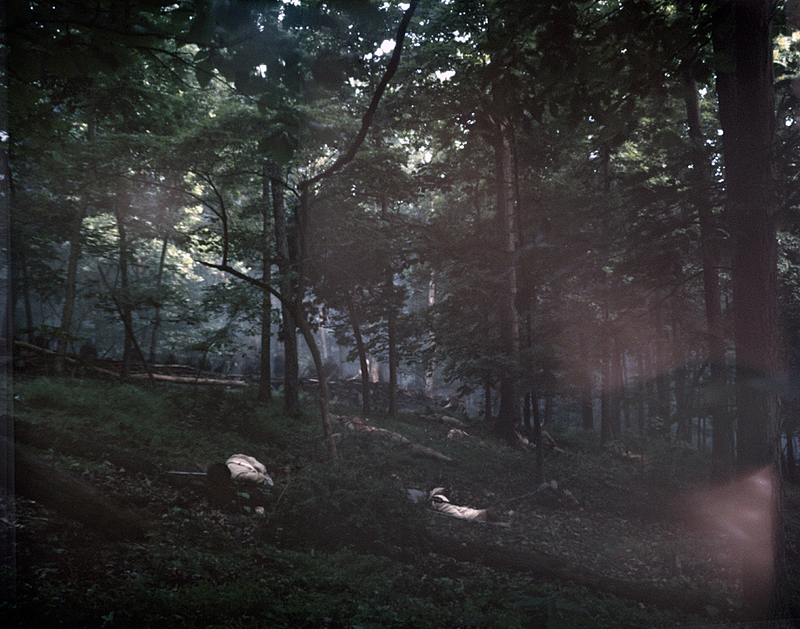 As the Confederates approached and attacked up the hills, smoke filled the trees as the Union reenactors held back the Rebel attack. 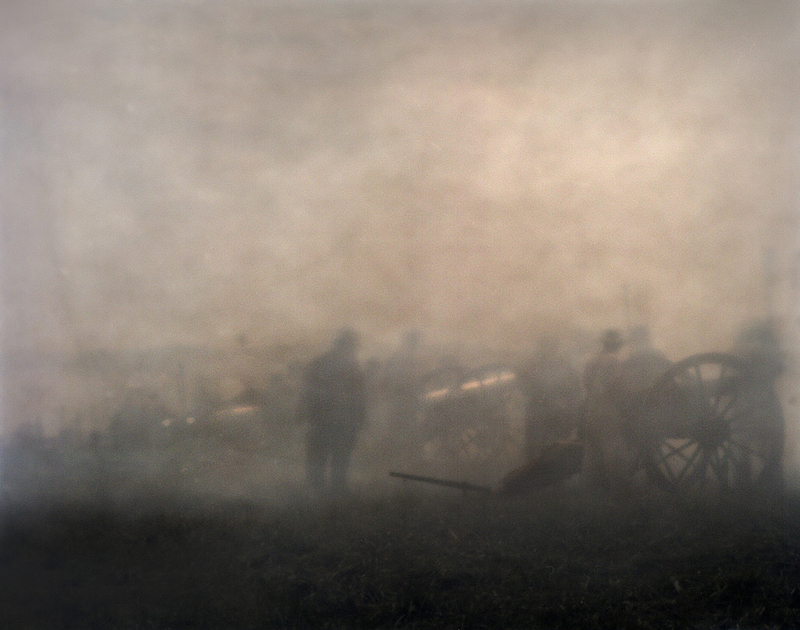 Seen from behind the Union lines, the silhouettes of the soldiers stood out amongst the trees highlighted by gun smoke; the Confederates a grey haze at the bottom of the hill. 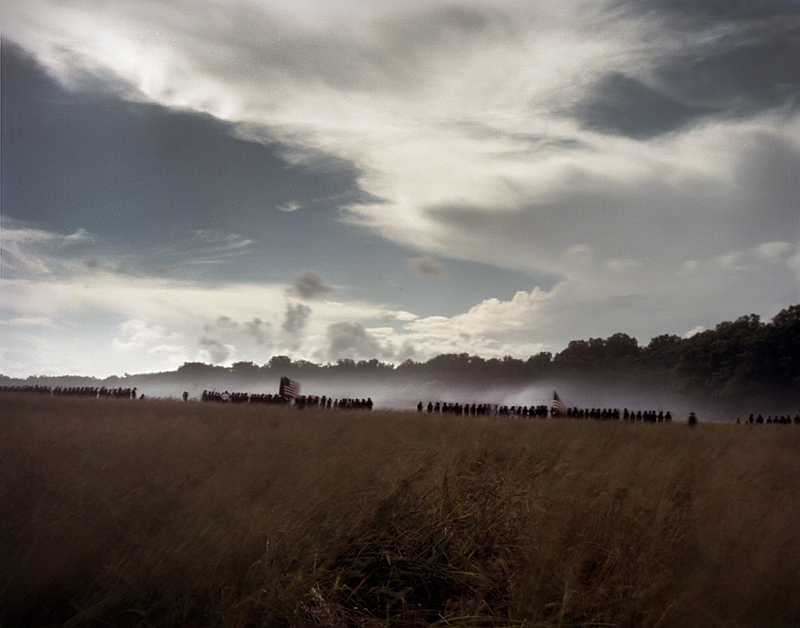 This four hour battle required me to change film in the field between the clashes. 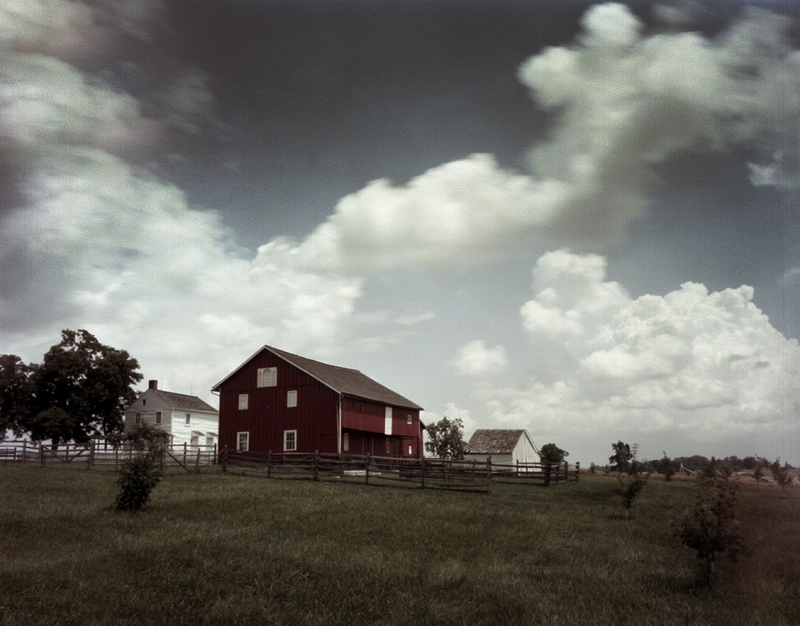 Sitting in the shade, between the Wheat Field and Peach Orchard fights, I sat under a tree, took out my portable darkroom, and started to change film in the 90 degree heat. Changing film in that kind of heat can be challenging not including the ticks falling from the above trees and crawling on me while my hands were busy in the changing bag…. What actually transpired in the afternoon and evening of July 2nd. 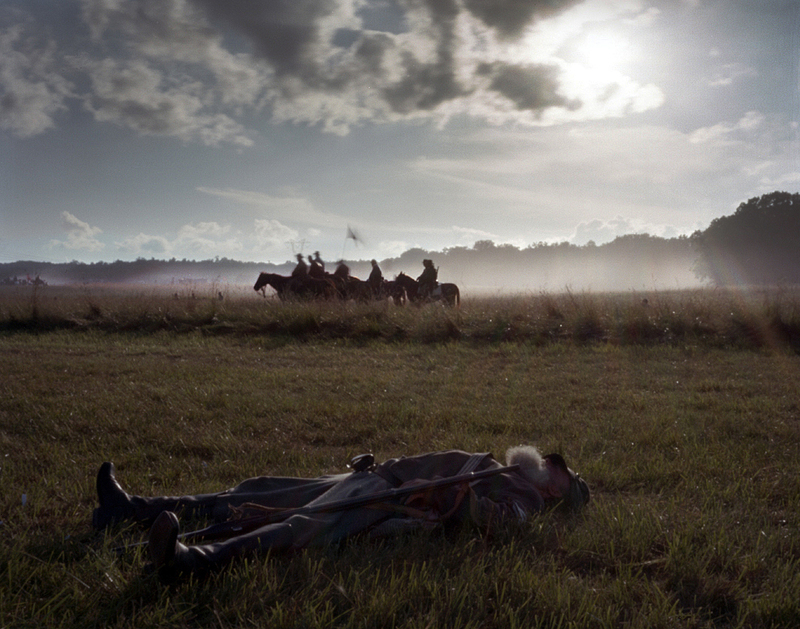 at Gettysburg in 1863, the Confederate attack on the Union left flank, with upwards of 14,000 Confederate attackers, was the Civil War at its bloodiest and most desperate. 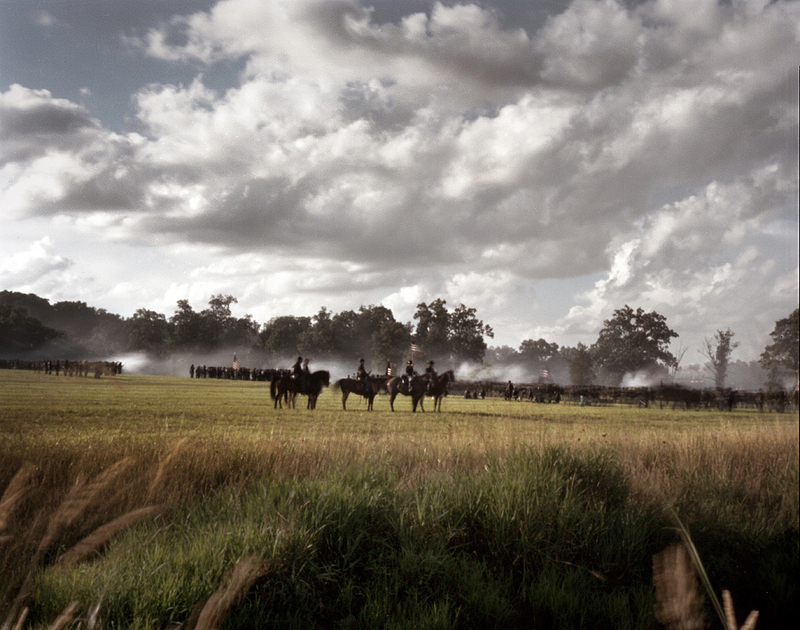 For instance the attacks by Longstreet’s Alabamians on the Unions’ far left flank, the Confederates making repeated charges up the Round Tops. 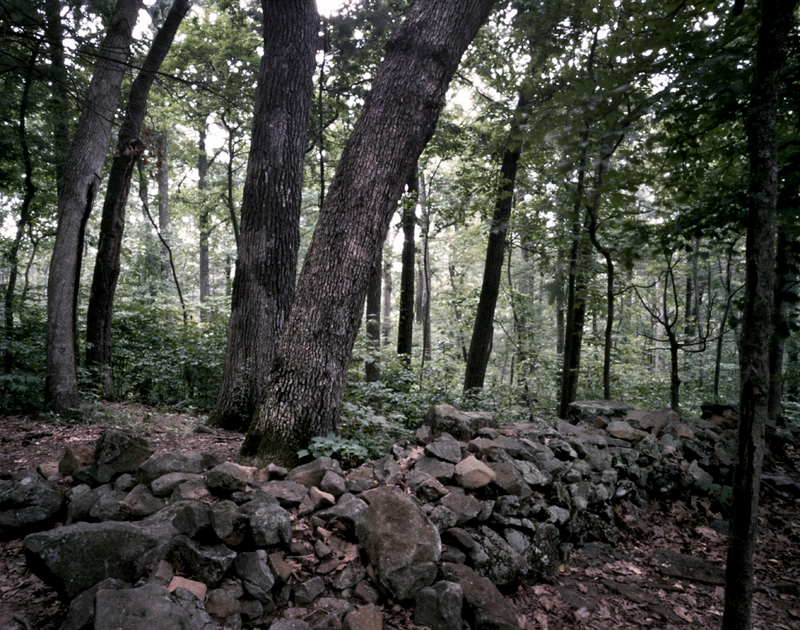 This fighting was made famous for the stand of the 20th Maine Regiment and their bayonet charge down Little Round Top ordered by Medal of Honor winner, the 20th Maine’s commanding officer, Col. Joshua Chamberlain. But prior to the fierce fighting at the Round Tops, all afternoon, Longstreet’s forces had been smashing into Sickles’ positions at the Wheat Field and the Peach Orchard around the Sherfy Farm. 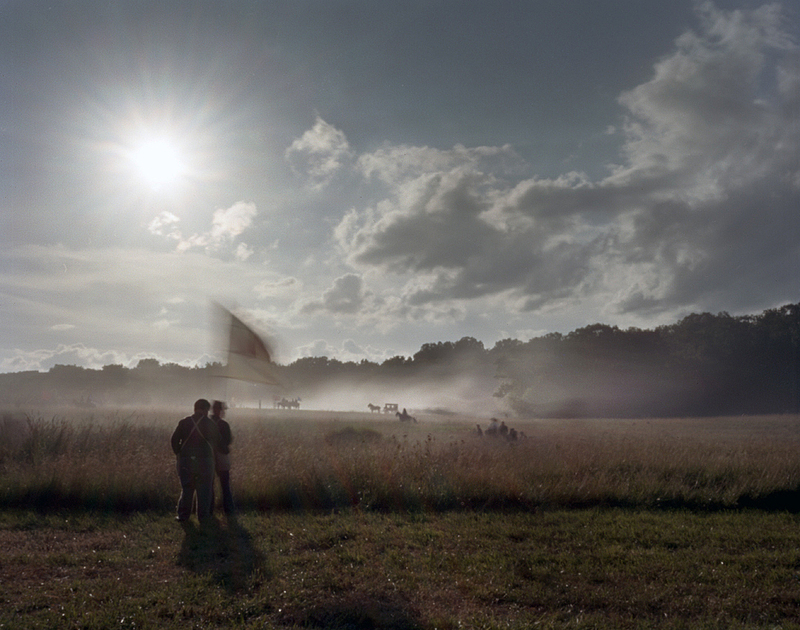 These overwhelming Confederate attacks eventually beat back Sickles’ men but fierce exchanges of ground occurred and last minute arrivals with more willing Federals filling the gaps. 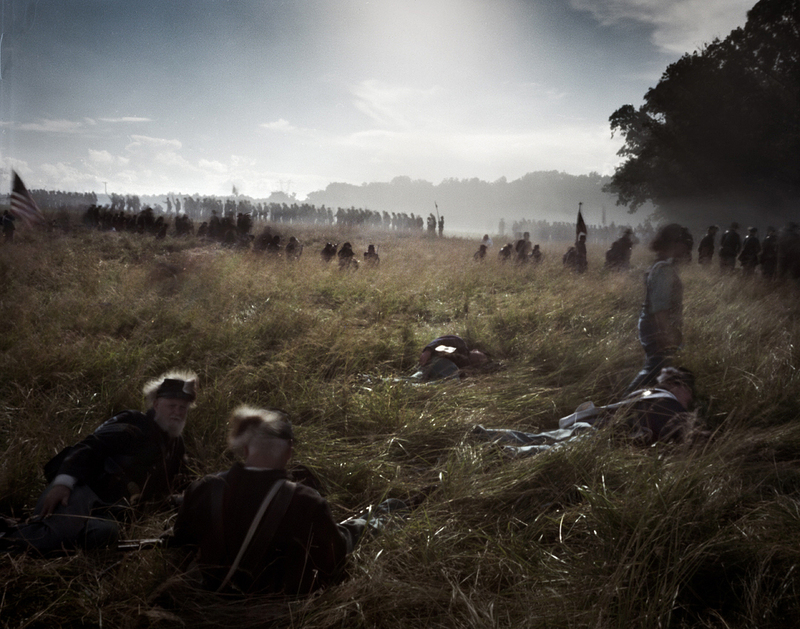 Fighting at the Devil’s Den, a prehistoric jumble of massive glacial boulders, became fierce as Federals hurried to reoccupy the ground after the Sickles debacle. Confederate General John Bell Hood’s division attacked as Union troops took up positions in the rocks at the Devil’s Den and along the Round Tops. Gen. Hood although grievously wounded in the attack, pushes his men on and eventually, and miraculously, the Confederates fight their way into the rocks at the Devil’s Den pushing the Federals from the position. 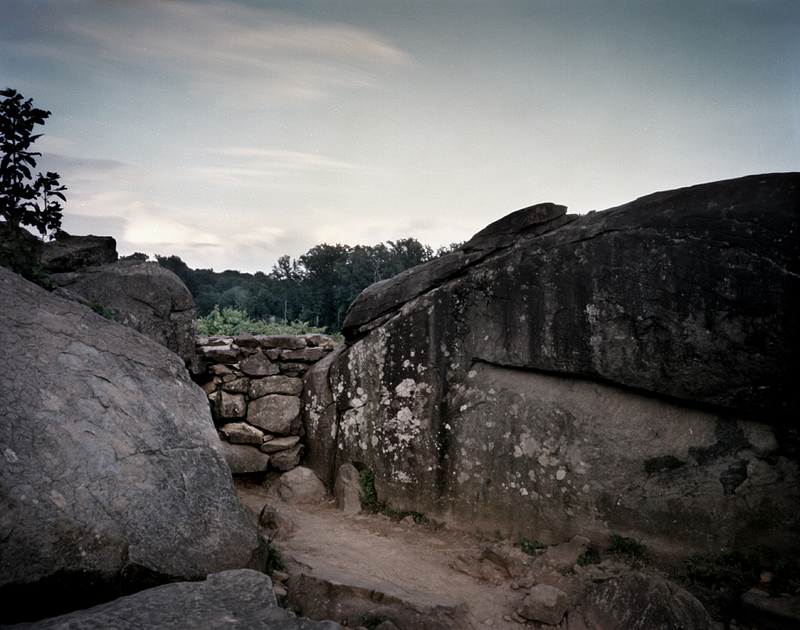 Hood’s soldiers hold the Devil’s Den, using it as an effective sniping position and fortress, for the rest of the days’ battle. Today, walking along the huge complex of boulders at the Devil’s Den, looking down into the crevices, deep “alleyways” down between the rocks, you can see and imagine hundreds of men crowding and seeking protection in these crevices as Union fire descended from the Round Tops. 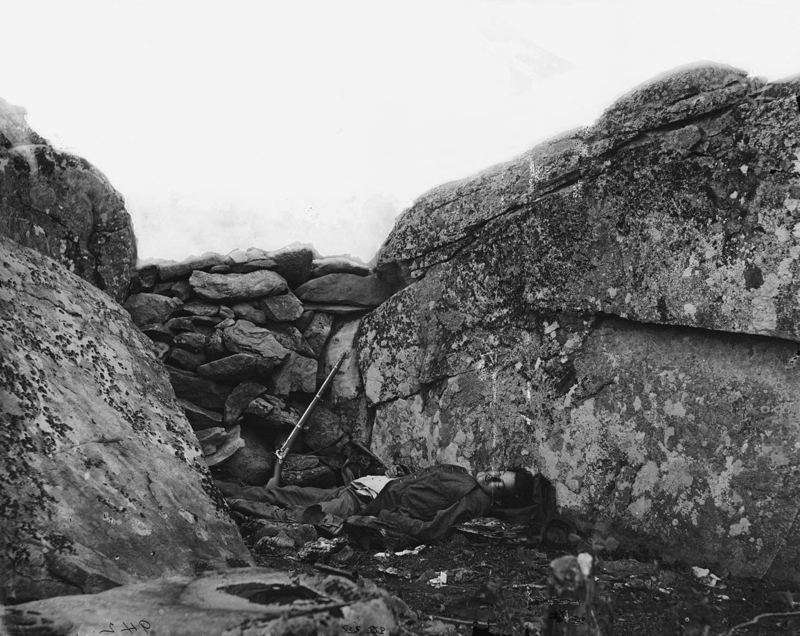 The site of the now famous Alexander Gardner photo of the “Dead Rebel Sharpshooter” is still there at the Devil’s Den. The little nook between boulders, with the small neat rock wall merging the natural casement, still conceals a good sniping position. 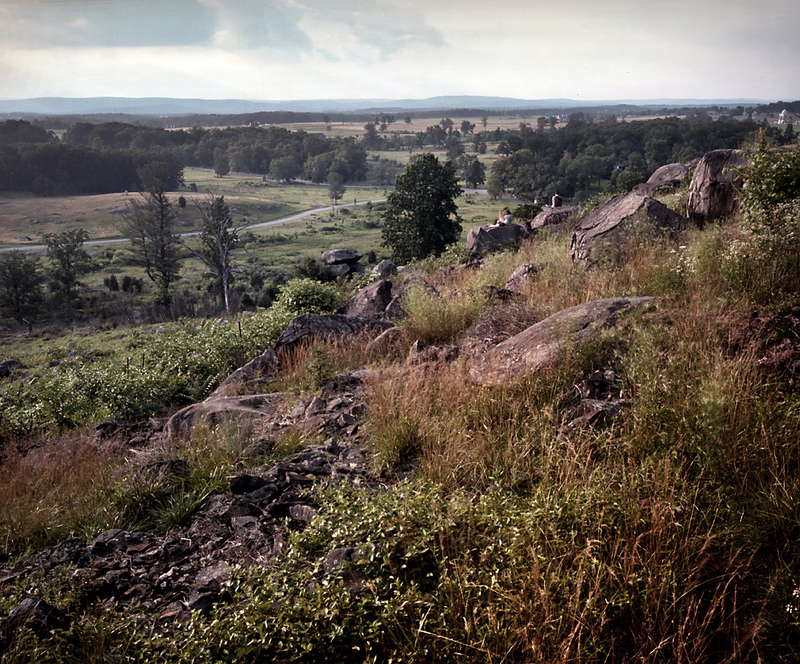 Standing in the “Sniper’s Den” one gets a clear, unobstructed view of the Union position on Little Round Top. 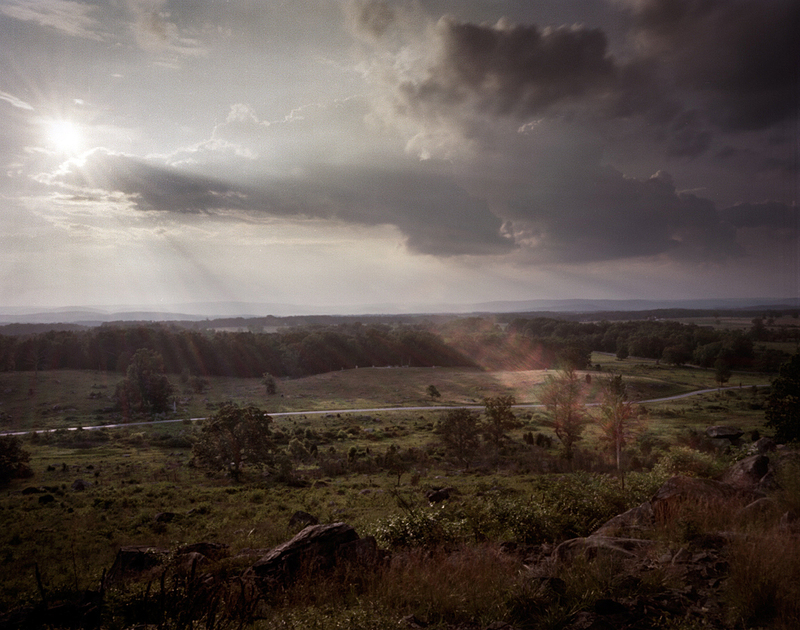 The Valley of Death at Gettysburg, Pa 2013. An excellent view of the Devil’s Den can be had from the bald summit of Little Round Top itself just a few hundred yards away. From here, as Union Gen. Warren quickly surmised and called for reinforcements on July 2nd 1863, nearly the entire battlefield can be viewed from Little Round Top. The Devils Den below, the Wheat Field and Peach Orchard beyond and in-between, the Valley of Death. The view from Little Round Top today is beautiful, absolutely stunningly laid out before you with a wonderful variety of glacial rock formations, hills and wooded tracks interspersed with meadows, farm houses and fenced-in cultivated fields…..and hard to fathom the cataclysm that occurred here 150 years ago. 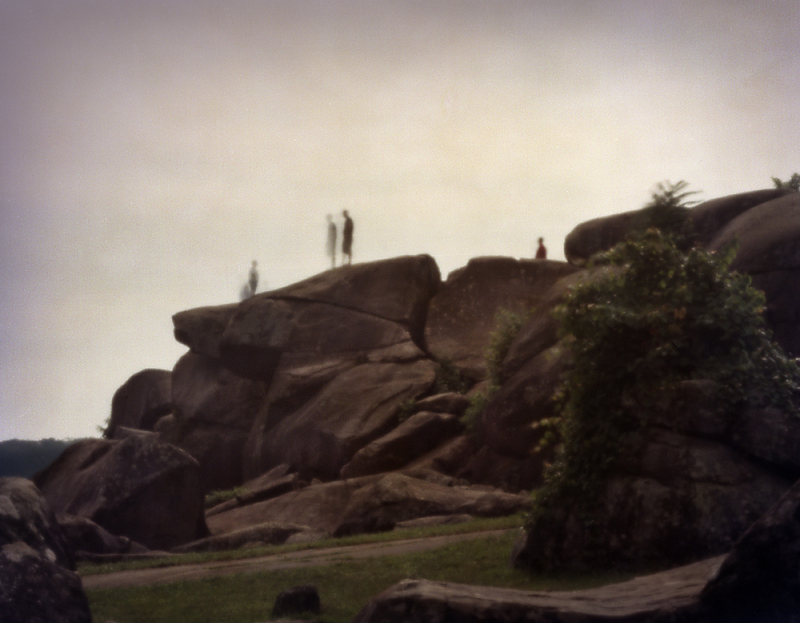 For example, the distance between the Devil’s Den and Little Round Top is quite close. In fact if you clap your hands at the Devils Den today you will hear three distinctive sound slap-backs. 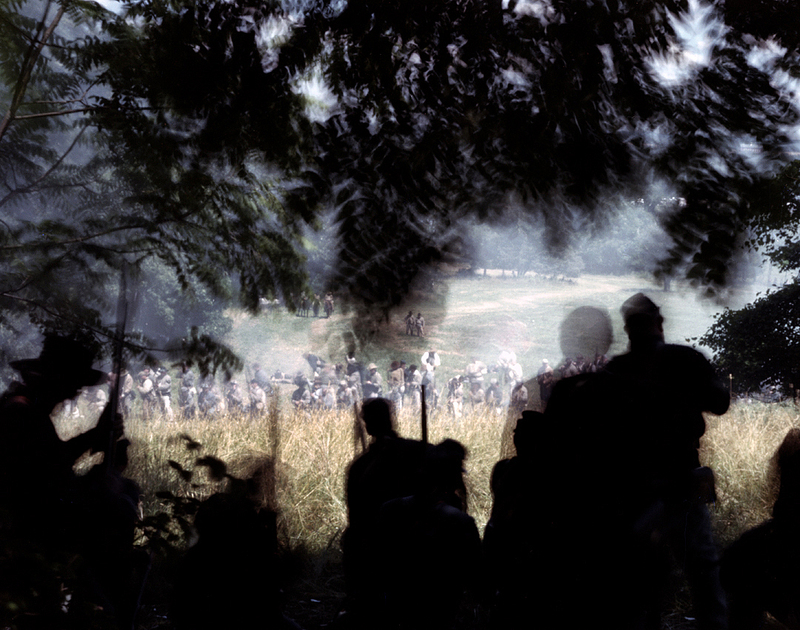 During the fighting on July 2nd, with Rebel guns in the Devils Den and Union artillery on the Little Round Top above exchanging salvoes, combined with the incessant volleys of musket fire, the concussive sound waves caused the soldiers ears to bleed. 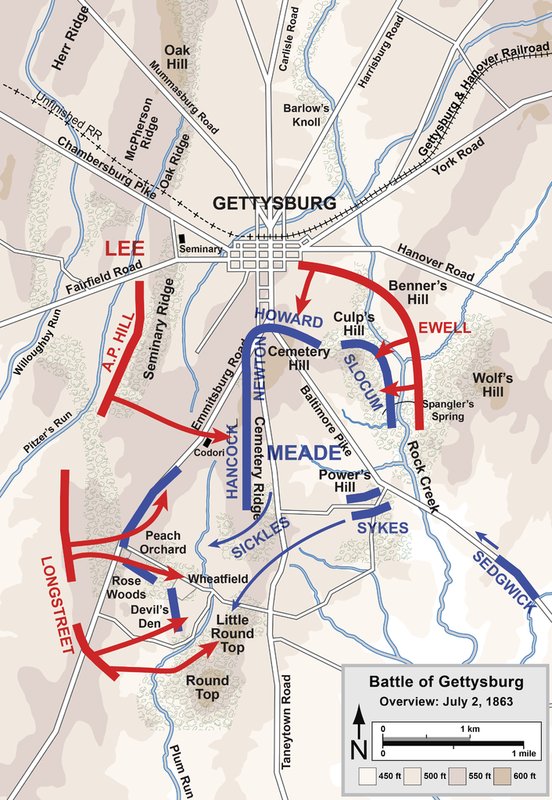 During the late afternoon fighting, Dan Sickles has his leg blown off by a cannon ball near the Peach Orchard but General Meade has things in hand and saves the day by getting every soldier available to the crisis point at Gettysburg on July 2nd 1863. 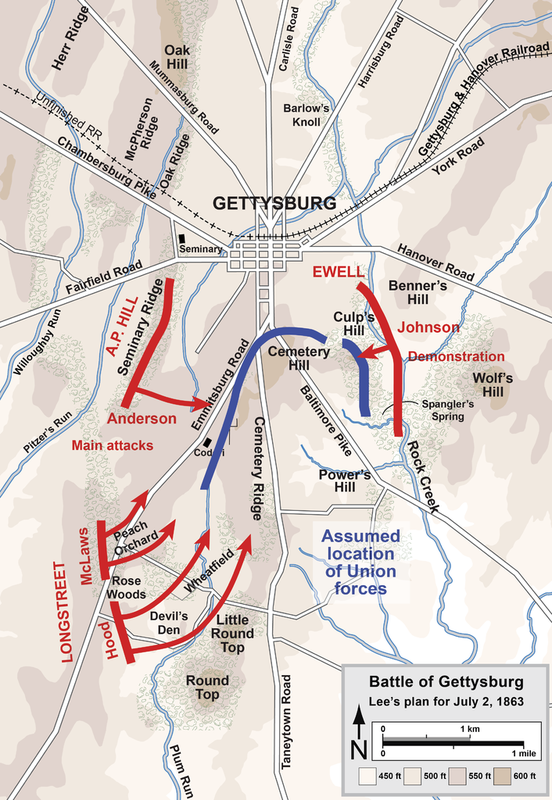 Attacks on the Union right flank at Culp’s Hill and East Cemetery Hill on July 2nd, were also conducted by the troops under Confederate General Ewell but these attacks were uncoordinated with the main Rebel assault and ultimately failed. 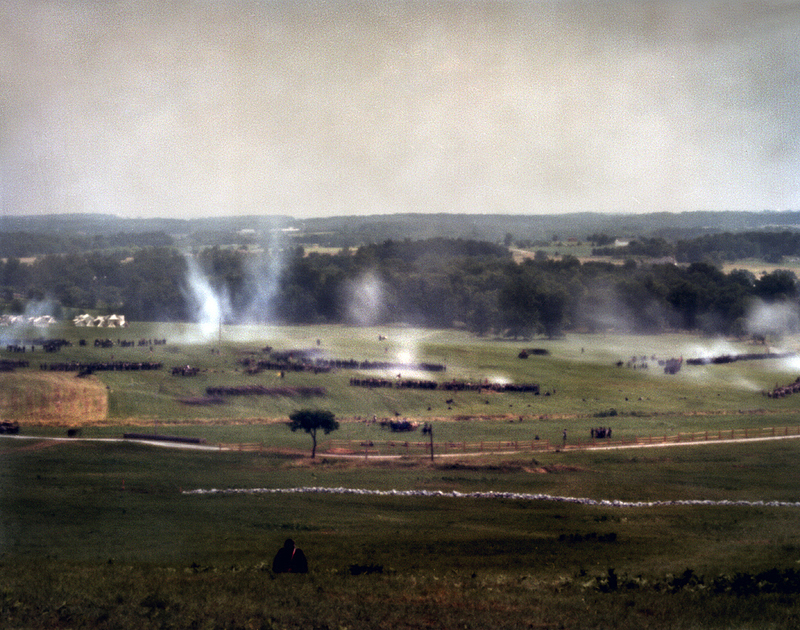 The Union positions at these salients were strong and reinforced so fighting petered out that day with thousands of casualties strewn across the fields of Gettysburg.